It was the hour when the vague purples of the night were fading into the early dawn, and through my wide open port and the lattice of my cabin door blew the fresh wind, and with it, softening its salt briskness, just the faintest suggestion of balminess, of spices and cocoa-palms, guavas, parakeets, and pomegranates, and little naked, soft, brown babies rolling in the sun. It is unmistakable, this breath from the tropics, and it greets one with all of the suggestions of its easy, open life. I did not need the low banked silhouette against the horizon, rising like the ragged fin of some submerged monster, to prove our nearness to land. In the quick dawn of the tropics it rapidly defined itself in a long, low outcrop of jagged volcanic rock that rose slightly above the thin, white thread of surf surrounding it; and then, almost at the instant, in the sudden glow of the bursting furnace of mother-of-pearl that ushers in the tropic day, the island of Curacao stood forth, shimmering like an opal on the sapphire sea. But in that instant the soft, caressing suggestions of the easy tropics, carried on the balmy breath of the dim, purple dawn, were dissipated. In that ragged backbone of volcanic action no palms stood out, with their feather duster tops swaying above the surf; no cool verdure stretched itself into the rolling distance; and no ef­fort of the imagination could revive the suggestion of the little, naked, soft, brown tropical babies rolling on the harsh cinder ­and clinker beaches except they were safely clad each in a little hobnailed nightie. In the fresh sparkle of the cool morning this ragged strip of wreckage from some primeval cataclysm fed the eye with every subtle, flickering color of the opal - except green - a barren, arid oasis set in the endless sweep of sapphire ocean. Here and there, perhaps, were ghastly patches of an ashen verdure that seemed like some lichen clinging to the barren surface. Later these ashen patches proved to be straggling groves of the bitter or­ange, the island's sale product, from which is made that fine, aromatic cordial that has spread the name and fame of Curacao. Even the cactus - except the most lowly crawling members of that humble family - refuses to survive except in the carefully tended pots of some wealthy Dutch trader. When the Dutch farmer starts out to plant an orchard of the bitter orange, or to increase the size of his present planta­tion on the surface of this huge cinder, he proceeds with a drill, a box of dynamite, a pick, and a crowbar, in place of a plow. He blasts a series of little depressions, fills them with imported soil, wedged in with the bits of broken rock, and plants a scraggly sapling that somehow manages to survive in the struggle with an embittered and arid Nature; for Curacao shares with the never-to-be-mentioned place the dis­tinction of rainlessness. But the one feature that Curacao has produced in perfect natural magnificence is an ideal harbor. 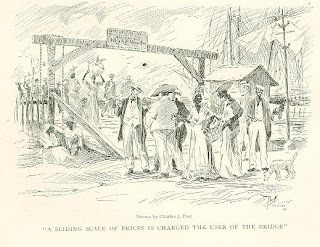 Whether to meet the needs of security against the shrewd de­signs of predatory neighbors, as it ap­pealed to the eyes of the strenuous "gen­tlemen adventurers" in the gilded days of the buccaneers and the Spanish Main, or to fulfill the modern complicated necessi­ties of a naval base and coaling station, or the demands of ocean commerce with ships of heavy draft and giant tonnage, Nature has forestalled the need. Great Britain could double the size of her navy, and still be able to shelter it in the basin of the great rock-locked lagoon, secure from any stress. The ragged coast line of the island, with the surf boiling and eddying in the fangs of volcanic rock, is a natural guard against any attempt at hos­tile landing, while the narrow neck of the bottle entrance to the lagoon becomes, with the lightest of defenses, impregnable. Wandering avenues and tortuous alleys straggle back from the shores of the en­trance, lined with prim rows of immacu­late Dutch houses apparently designed in loving remembrance of the blue delft plat­ters that depict old Manhattan in the ancient days of Wouter Van Twiller­ - this is Curacao's sole city, Willemstad. In those same old days, the natural ad­vantages of this snug harbor were not one whit less obvious to the canny old Dutch­men who have profitably pirated, bucca­neered, and smuggled through the chan­ging centuries. It has also done a large and thriving business in revolutions, but this is recognized as a distinctly legiti­mate form of business, and a great ad­vance over former reckless lawlessness. Even some of our American captains of in­dustry have been accused of taking a little flyer in this line, although disastrously, as was shown by years of ensuing litiga­tion and subsequent heartrending agonies. Less than fifty miles to the southward lies the coast of Venezuela, which has been a splendid market for this bustling trade in revolutions; and Venezuela is the chief -and ungrateful - debtor. As the steamer's head swings round, we point for what is apparently a long, low pontoon wharf that stretches between two rocky little promontories. Beyond, rising mysteriously and seemingly out of the streets of scrubbed houses and red tiled roofs of the town itself, are the high, slen­der masts of the Dutch schooners, with their brailed up topsails swinging in the breeze. From a little toy fort on the right a military semaphore is wigwagging the official announcement of our arrival. Unofficially, but more promptly informed through the simple exercise of their own senses, the black Dutchmen who make up the stevedore population are already hus­tling for a job on our cargo when we shall have docked. From the sacred eminence of the steamer's bridge the pontoon dock develops as a bridge connecting the separated halves of Willemstad across the bottle-neck entrance to the great lagoon beyond. With placid Dutch stolidity it bars our way. We do not slacken speed, and Captain Bennett, the august ruler of our steamer realm, is briskly humming, turn and turn about, snatches of the "Machiche" and Moody and Sankey. It becomes quite apparent that the usual method of entering Curacao is to cut our way blithely through this bridge, a charm­ing little variation from the dull rou­tine of the ordinary methods of docking. I am aware of a vivid thrill of curi­osity as to whether I am to be ushered to my final reward to the barbaric strains of a muscle dance or a droning hymn. 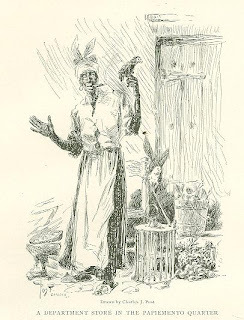 I am still pleas­antly expectant when, most disap­pointingly, a burnished brass kettle at one end gives a shrill scream and a wheeze; from some­ where comes the rattling of chain; little black figures and the gay turbans of the Martinique market women who have lined the rail of the pontoon, scuttle for the shore end; an open gap of blue water appears; slowly, while the little brass ket­tle puffs and grunts as it strains on the submerged cable, the line of pontoons swings back on its hinges like a rusty farm­yard gate, and we glide past into the trans­parent waters of the harbor. And below these wonderfully transparent waters of the tropics the harbor bottom reveals the usual harbor collection of broken crockery, castoff kitchen implements, shoes, and bot­tles, over which occasionally drifts some brilliant fish on a tour of inspection. Thou­sands of floating bottles dot the surface,­ "dead soldiers," that are the empty vo­tive offerings of the sailors from a Dutch warship who are celebrating Queen Wil­helmina's birthday. But what a city, what a place - that is, for the tropics! The swarming mobs of jet-black Dutchmen, filling the air with their assorted dialects, and the intense blue of the sky, alone suggest the tropics. It is Amsterdam, Rotterdam, Schevenin­gen, or our own Manhattan of its early years - anything but a city of the lazy, easy tropics. On each side of the lagoon stiff old Dutch warehouses rear their characteristic fronts close to the water's­ edge in starched, prim, and scrubbed spot­ lessness. In the distance, rising against the barren volcanic slopes, are other stiff Dutch houses fronting on prim residential streets, while connecting the two parts of the town is a scattering collection of red-tiled Dutch roofs grouped according to the vagaries of the wandering streets and alleys, these straggling streets being the only manifestations of the Dutch that are not stiff, prim, rectangular, and scrubbed. Even the little trading-schoon­ers that cluster in swarms along the ware­house districts, high of prow and of extra sheer, are dazzling in their spotless white paint, while many a yacht might envy their immaculate decks. Smugglers and traders everyone of them, or harmoni­ously combining both with admirable Dutch thrift, as the season or the demand may require. 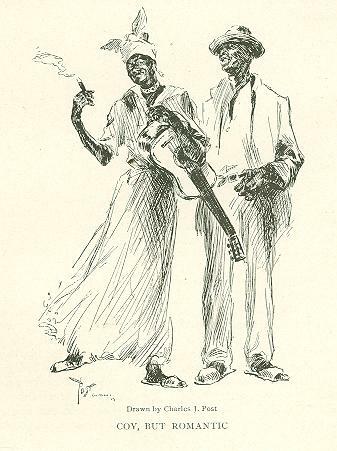 On their decks, and under the shade of patched awnings, lounge their picturesque crews, Barbadians, Trinadados, Haitians, Jamaicans, and the huge, half-savage men of Martinique, as black as the shadows of a coal mine on a moonless night, but whose wide, flapping trousers match the spotless­ness of the schooners' sides. Half pro­jecting through a companion hatchway is a leather visaged Dutch skipper exchang­ing nasal, clicking Dutch profanity with his parrot, which is perched on the ancient copper inlaid wheel. Hatchet faced and gimlet eyed, lean and tanned, with his swaggering silken sash, the skipper might have but just. stepped out of the pages and pictures of some buried treasure and ­pirate tale. Once clear of the bottleneck lagoon, he will carry sail like a skipper out of Gloucester on the slender, tapering masts that lift above his deck like those of a cup defender and for some of the phases of his delicate profession he has need. Throughout this schooner fleet one may follow the evolution of the tiller to the present wheel, in the curious tackles and obsolete contraptions by which they obtained a purchase on the tiller. Here, too, are the surviving types in the rigs of the olden seas brigs, brigantines, lug­gers, and now and again a ketch that brings to mind Decatur and the Tripoli­tan pirates. The ketch is a schooner rig, but with a huge yard on the foremast, from which depends a tremendous sail hung like a parlor curtain on sliding rings. Furled, it droops in long folds against the mast. 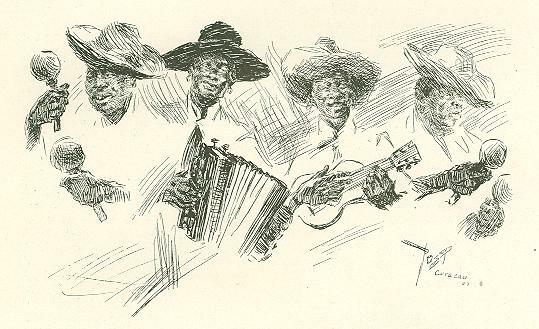 And in this swarming motley of black­ and tan Dutchmen what a medley of dia­lects! Atrocious Spanish, barbaric French, mutilated English, Dutch that is as per­fect as that in The Hague, to a Dutch patois that is hopelessly maimed, but which, to the untrained ear, does not dif­fer in sound. Finally, throughout it all, there is the general language that Curacao claims as its very own by right of birth, Papiemento. It traces its origin back to the days of the flourishing slave trade, when the slave corrals would be filled with the cargoes of newly arriving trad­ers, and two score African dialects would wrestle for supremacy and understanding with the Dutch and Spanish overlords. Today it is a real language, spoken in the schools, in the houses of business, on the streets, and it is the first tongue that the little Dutch colonial baby acquires. In it one may detect a relation to all of the above tongues, and even to English. In the course of centuries even the pidgin dia­lect of the Orient may arise to the dignity of a language, as has Papiemento. This same Babel of tongues swarms over the gang-plank as soon as the lean Dutch officials of the port have left the ship: hotel runners, purveyors of dried and prickly fish, shells, baskets, birds, cages, inlaid boxes, shark bone canes, and priceless treasures of what-not rubbish, and they are instantly swept over the side by the vigilant stewards. The remainder of your stay they hopefully waylay you around the corner on any casual stroll through the spotless streets. "'Scuse me, suh, but I's a British ob­jec'." And then hard on the fact of black Dutchmen, comes the amazing existence of thin Dutchmen -thin and lean and long, and with visages of parchment. It upsets all of one's firmly preconceived ideas on the subject of Hollanders. When we have lent our imaginations to the mat­ter of Dutchmen, there has loomed before us a plump, pink-cheeked, rather stodgy person, with an ample melon stowed beneath his waistcoat, who wheezes con­tentedly at the glazed end of a "church­warden." But here, on the contrary, he is found built along the general dimen­sions of a flute, with a vellum complexion, like a leaf torn from an ancient black ­letter Bible. In place of the long "church­warden," a black cheroot extends from the end of a slim cigar holder; large, cyl­indrical trousers of immaculate linen or pique, a black string tie, and a massive gold watch-chain, indicate the local fash­ion and taste. Everywhere throughout the rambling streets he is the same shriv­eled type; you pass him on his way down one alley to his counting house, and the next minute you all but bump into him around the corner as he is leading his string of assorted progeny on their sol­emn, hygienic stroll, while across the way his prototype folds himself carefully into the tiny two seated tram that encircles the town, on the way to the "Club de Gezel­ligheid" ; but always there are everywhere these cylinder trousered, thin-flanked, parchmented, blue-veined, and gimlet­ eyed survivals of a plump nation. For the sake of the most exact accuracy I will add that I did encounter three fat Dutch­men and heard of a fourth, but whether these were objects of envy or of commis­eration, or were simply preserved as the standards of tradition, I was unable to determine. From each end of the pontoon bridge, and meeting at the apex of an irregular horseshoe curve, is the fine residential street. 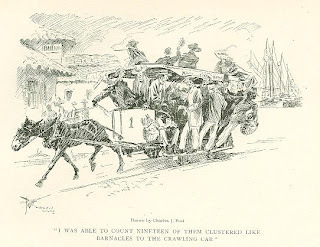 The two tiny tram-cars, of one ­mule power each, that represent the traction necessities of the colony joggle around the circuit every hour, and fortunate it is for the one mule power that the Dutch­men are lean, for on one circuit I was able to count nineteen of them clustered like barnacles to the crawling car. Here on this street are the local palaces of the mer­chant and banking potentates, the solid aristocracy, their houses looking for all the world as if they had been exported from Holland in huge packing cases - ex­pensive, exotic, rigid, and scrubbed. They are a gay collection, some in prim brick, with marble and blue delft trimming, or again in maroon, blue, yellow, or pink stucco, with empty gardens of tile and gravel. Now and again there is an elabo­rate and expensive fountain, dry and dusty in this arid settlement where water is an article of commerce. Some with a rugged taste plant their aristocratic domain with cast iron fauna and bloated Cupids that blister in the blazing sun. In place of cool green lawns, are expanses of hot gravel interspersed with blasted holes in which scraggly bushes of ashen foliage produce brilliant blossoms from imported earth. 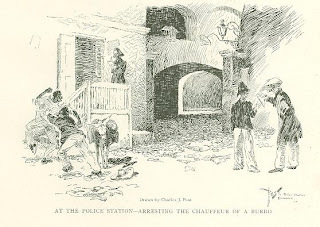 Generally a high wall surmounted with broken bottles guards three sides of these enclosures, while the front, open to the public gaze, is protected with chicken fencing or, in a few cases, with elaborate grilles of wrought iron. There is over an unbroken mile of this gaudy, hot, scrubbed, rectangular aristocracy, and then, swing­ing south to the other side of the lagoon, there begins the less aristocratic, but thor­oughly respectable, quarter, where the smuggling and revolutioning has not yet reached the full financial flower, and in which are still mixed the churches, schools, and public buildings. In all the schools, from the most exclu­sive to the humblest government school, in which the little black or parchment Dutch twigs are bent, Dutch, French, Spanish, English, and Papiemento are used and taught. By the neighboring islands, and even on the mainland and as far away as Central America, these schools are highly regarded, and a large number of foreign children are sent to Curacao to get their education. For religion there is an ample supply of churches - an all but solid phalanx of Dutch Reformed edifices and dominies. One or two modest Catho­lic chapels live in the outskirts, missions, in fact, for the islanders are uncompro­misingly Protestant, a curious condition for any portion of the tropics of this hemi­sphere. In the rear of the elaborate sys­tem of colonial offices known as the Government House is the official edifice of the Dutch Reformed Church; a severe and antique colonial structure built in 1769. Stolidly and punctually each Sunday its high backed pews are filled with the lean parchment smugglers, revolution brokers, officials, and colonial aristocrats and their phlegmatic families in crackling starched pique. Here, high above their Reads; in a massive mahogany pulpit, the grim dominie preaches his clicking, nasal sermons and joins with his flock in the thin, quavering old Dutch hymns. It was just around the corner from this church that one of the parishioners organized the mob that attacked the Venezuelan consul and his family when feeling between Castro and Willemstad ran high over the inter­ruption to the smuggling and revolution­ary activities of the latter. The little policemen, with patient politeness, urged the mob to please not - and then went back into the police station and resumed their hammocks. As each half of the town visits the other half at least once every day, the income accumulates a pleasant little return on the bridge investment. But the bridges, after all, are only for the common people. 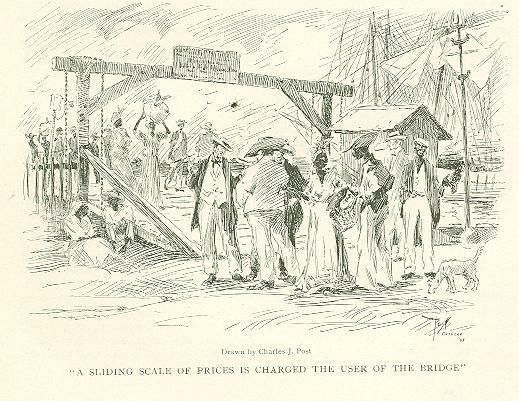 The really aristocratic way to reach the other side is to be sculled across in a heavy dinghy; then everyone can see that you are able to afford ten cents for the passage. When these pleasures have exhausted themselves, there remains the cool porch of the "Club de Gezelligheid," from which point of vantage one may view the whole as a panorama and listen to the shrewd old Dutchmen as they select one from the twenty brands of gin that stock the bar that, with its inevitable dash of bitters, slowly consumes the afternoon in deliber­ative sips. There are also sugary, aro­matic liqueurs with queer names that come in even queerer bottles, and are served in tiny glass thimbles, with great goblets of water on the side. Then come the fero­cious, long, black cheroots that take the men of vellum to smoke them; or perhaps it is the smoking of them that makes the men of vellum. Below us streams the gay black throng, augmenting with the close of the day - ­nice elderly ladies as black as the silk gowns that rustle with the swing of their easy stride, and with nice, fat cheroots that are seldom removed from between their lips except to add emphasis to some matured and pithy remark. From the shadowy alleys comes the tinkling strum­ming of an occasional guitar and its small relative, the "cuatro." Down near the smuggling schooners a hand organ is grinding out, "After the Ball," the most popular and enduring song in the world,­ and a thin, cracked voice is trying to sing it in maudlin, broken English; little lights flicker across the lagoon; a tumbler shat­ters itself against the wall, and the fragments clink musically on the tiled floor; more lights flicker from across the lagoon; and in the quick purples of the afterglow Willemstad, this "Spotless Town" of the Caribbean, with its stiff, Old World toy ­houses, settles itself for the night. Originally published in the Century Magazine. December 1909.